I have always been inspired by Scandinavian himmeli mobiles and this is my modern take on the centuries old art form. My collection of mobiles were designed to delight a child drifting off to sleep, but can be hung anywhere in your home! Hang alone or pair them together. They slowly spin while casting intriguing shadows on the wall. 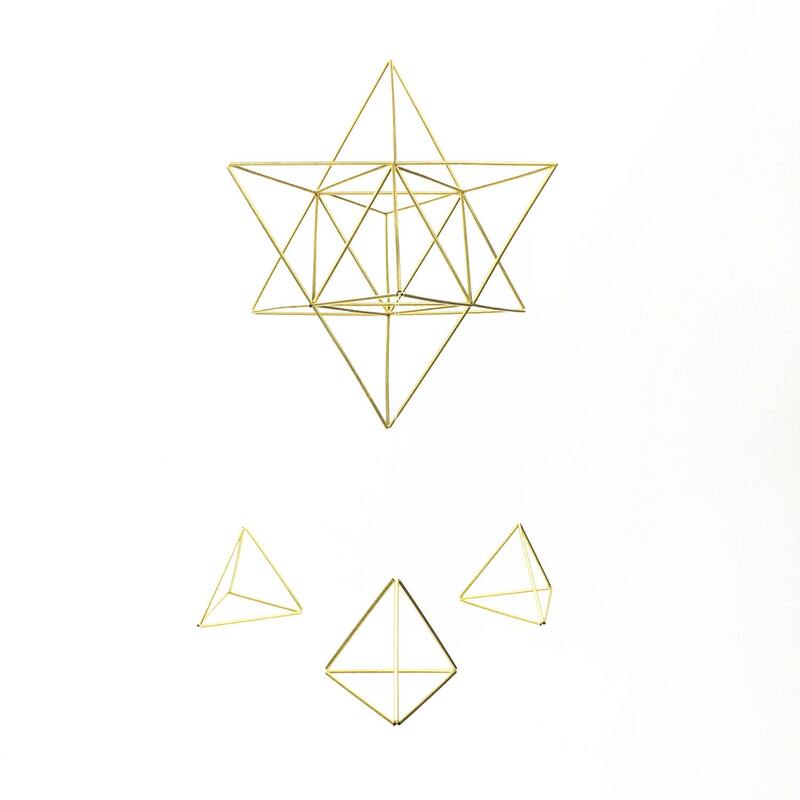 ▶This Stella mobile includes one large stellated octahedron with 3 smaller triangles hanging down from each corner. ▶Originally himmeli mobiles were made from rye straw and hung over the dinner table to ensure a good harvest. This himmeli is made of brass so it can last for many years to come. ▶Brass and silver may age or patina over time. Use the appropriate polish to clean your mobile if you do not prefer the aging. The best part of this mobile is that after my kids grow up it can be a beautiful piece of art in my home. Absolutely love this tree topper — it’s pretty enough to display year round! Beautiful piece! Exactly what I was looking for. Seller was very kind and prompt with responses. Highly recommended! I accept Paypal and credit cards. Your item will be crafted and shipped after your payment has cleared. All items are made to order. I accept returns if items were damaged upon arrival or if they do not arrive as described (which should never ever happen!). I package all items with extreme care because the pieces are delicate. Please read my descriptions carefully and be sure to contact me within 24 hours of delivery if your item arrives damaged. If a return is accepted, there may be a restocking fee depending on the item you have purchased. If an item is not picked up from the post office or is unable to be delivered, you can pay to have it shipped again, or it can be returned with a 20% restocking fee. Custom items are non returnable. Please feel free to contact me if you have any questions before you make a purchase. I ship anywhere! Just check my rates and convo me if you have any questions about large quantities! Items are extremely delicate and hand made. They will be shipped with great care. Please make sure that you open and unpack all of your items with the same care. Please contact me within 24 hours of receiving your items if you have any issues. Almost all of my items can be purchased in larger quantities. Please convo me with info about what you would like so i cant give you a quote. Also if you like one of my designs but wish to have it in another finish or size, please ask and i will be happy to try and accommodate your desires.